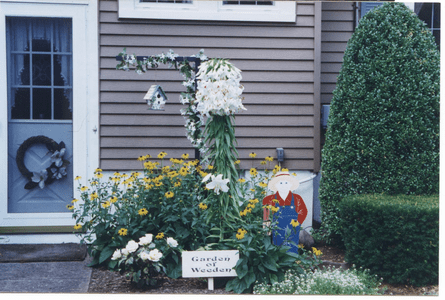 Mrs. Ruth Sanclimenti's whimsical, "Garden of Weeden" drew attention from the neighbors last summer. Her Oriental lily, 'Siberia' had a fasciated stem [which happens on occasion] causing the plant to overwhelm it's owner with [many] more than usual, highly fragrant blooms in midsummer. Only about 1 in 10,000 lily bulbs create a fasciated stem, most likely due to environmental fluctuations. The next growing season produces a normal stem, or even two, if the bulb has divided.